Each year the mansions in the historic district of my town are decorated for the holidays and opened to the public. I toured them, enjoying the beauty of the sounds, scents, and colors. One of the rooms in a Civil War home was decorated in white: white tree, white wrapping papers, white antique Father Christmas dolls, white flowers, all aglow in candle light. The textures were soft, making gentle what might have felt stark. The lightest shades of ivory and cream softened the overall feel as well. Colors and candlelight speak so much to the ambience of the holidays. And yet, I find that white touches me deeply during the holidays. 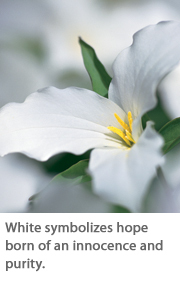 To me white symbolizes hope born of an innocence and purity. As if a promise that from the cold of winter hope is gestating, waiting to arise. White is the purity of light. It symbolizes the sacred, the divine from which we came. True white light is the greatest luminosity known, holding within it the entire spectrum. Pass white light through a prism and watch it fan out into a peacock tail of rainbow colors. White makes a clean background from which other hues can shine, and it harmonizes with nearly every color. Vivids look exceptionally vibrant and tints especially charming against white. Low-intensity colors work better with an off-white, one that leans toward another color, like ivory or beige. The simplest palette of maximum contrast is white and black. For chic sophistication, string together beads of these opposing colors. To avoid clinical starkness, select luxurious finishes or shapes. Lustrous pearls of white and black are far more intriguing than the absolute white and black of opaque or matte finish beads. Color-lined and hex-cuts offer visual interest. Grays (including snowflake obsidian and hematite) also add depth to the white and black duo. White whispers innocence. Combine it with pink (such as rose quartz) to create a petal-soft, pastry-sweet delicacy. White and red, in tandem, can become either distinct (pearl and garnet) or flashy (snow quartz and scarlet red jasper). Use white to freshen and lighten a color scheme. Or use it as a fashion statement of refined grace. Nothing says elegance like pearls. Attired solely in white, one is perceived as cool and polished. White occurs naturally in beads of milky, semi-translucence agate, dolomite, chalcedony, howlite, and trocha and puka shells. Warmer white beads are those of bone hairpipe. The iridescence of mother-of-pearl is a colorful alternative to stark white. As long as there is light there is white, luminous and bright, bringing its promise of hope.